The Christmas holidays were a respite from schoolwork, but no such luxury for LSFC. The RIFA season was a disaster by club standards. Certainly, our league position could not compare with the achievements of previous sides. Thus, we trained through the Christmas break, hoping to at least salvage some pride in the STRAA. I first saw “Ghost” at home on beta late in December. The plot was simplistic enough, though I realised that research on the occult must have been substantial. There were so many insights on the afterlife which the unwary viewer could have easily missed. The film was definitely educational in the sense that it somehow shed new light on the usually difficult subject of death. It was actually Whoopi Goldberg’s hilarious portrayal of the phony-turned-real psychic Oda Mae Brown which thrilled me to pieces. When I viewed the film for a second time while we were in Cavite for the STRAA, the film would have taken on a new significance. Fireworks invariably ushered in the New Year. Frankly, I would have raised a fit had it been otherwise. I was just happy, like everyone else was in the country, to see the very last of a year which brought a prolonged drought, a beastly earthquake, and then endless rains and floods! The New Year, I figured, could only get better because the last one had been the very worst! Ten days later, I changed my mind. I was in a Moderators’ meeting when I was told about the accident. But what Joel Alcala nonchalantly told me was that Ariel was swiped, not run over, by a vehicle! I rushed to Magsino’s with Mr. Sarmiento and Mrs. Guevarra, totally unprepared for the sight of the ugly tire marks across Ariel’s belly, the emergency room staff desperately trying to revive him. To no avail, I did not have long to find out. Soon, they covered his head with the bed sheet, a little gesture which spoke of dreadful finality. I was, at any rate, already crying quite unashamedly! So were the rest of my players. They had all come to the hospital, having heard the sad news, each praying in his heart that a miracle would occur and Ariel would somehow make it. Alas, it was not a day for miracles, and soon the boys were wretched heaps crying in chorus on the stairs. We were back in school when Ariel’s brother Erik arrived, wanting to know what the bad news was. And just how, pray tell, was I to tell him? How was I to tell him that his beloved brother, who only that morning left home with nary a care in the world, was lying cold under the sheets on a strange hospital bed? I did not think I could be that brave, but tell Erik I did, a chill running down my spine as I did so! The following Monday, prayers were said over the public address system for the repose of the soul of Ariel. We all discovered a soft spot to Ms. Blanco as she wept over the P/A while reading her tribute to Ariel. I also had a little tribute of my own to say, and played three of Ariel’s favourite rock ballads. All fourth year classes went to Ariel’s home in Beredo Subdivision to pay their final respect. Though the whole community was still reeling from the shock of the accident, we were the ones who really took things hardest. Suddenly, death was not something for sick and old people alone! It was a grim reality which had already claimed one of us! On the day when Ariel should have been roaming the streets of Lipa to celebrate the fiesta with his mates, we were instead in Batangas to bury him. By then, I had no more tears left, having finally accepted, if not understood, the most unfortunate turn of events. Now the task at hand was to console Taxi, Ariel's buddy and soul-mate, whose tears had only then begun to flow. In retrospect, January was a month of emotional extremes. Five days after the funeral, the batch was riding the crest of a wave after having broken the one million-peso barrier in the Stallion Drive. Well, to be honest, not all the money was ours. But we set a hot pace after we overcame the initial hiccups, and once the batch got going, there simply was no turning back. An inspired 205 led all the way to get this one for Ariel. 202 was not very far back, and guess who finished third? Who else but 206! Yes, the very same class which I felt could have routed the field, but left it all to Sherwin, poor laddie! So now there they were, swallowing the bitter pill of defeat, not looking very comfortable about it, and probably feeling not just a few pangs of regret. So Mr. Silva, for whom the words “hase”, “hamit”, “hira” and “harurot” seemed to have been coined, would have to wait for at least another year before fulfilling his life-long dream of a two-page coloured spread in the yearbook. His class finished – surprise! surprise! – in the lower half of the year level. We all had him to thank, however, for the drive’s record-breaking success. After all, he provided much of the intrigue and colour which spurred other classes on to bleed more cold cash. Heavens! I figured anybody with a weaker heart could easily have had multiple strokes and died on the spot. Just a week before, I was down in the dumps, struggling to connect with reality. Now I was skyrocketing, having witnessed the seniors in a display of utter selflessness. 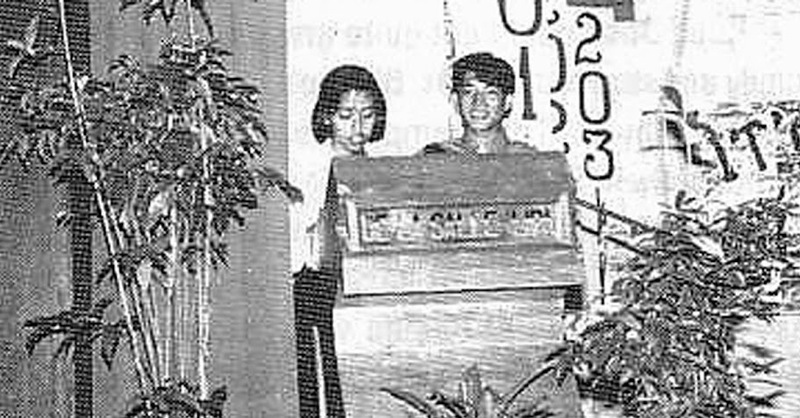 Once it became clear that 205 would emerge on top, all the seniors in the library, where the counting was being done, switched allegiance from class to batch and sweated to find out if the million peso barrier would be breached. The faculty and staff day at the end of January was rather special. I was missing from the morning program because I did not want to break my team’s training momentum. I was out in the field, therefore, sweating it out with the rest of the lads. For the afternoon program, however, I was in charge. The concept for the afternoon’s games was rather silly, something developed by myself and my advisers. Yet it worked particularly well. 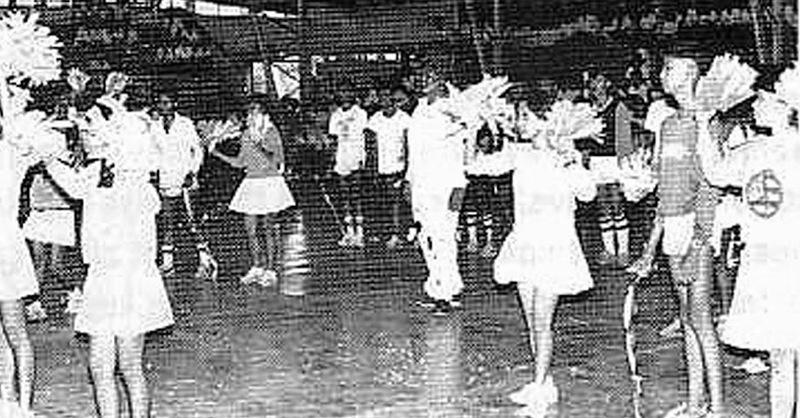 Members of the faculty and staff were given names of actors and actresses, then grouped into teams bearing the names of movie outfits like Viva, Seiko, Regal, Imus and FPJ. We even had shirts printed for the occasion. For the day, Tess Latay was Rita Avila, Nol Aquino was Richard Gomez, Rene Salazar was Ramon Revilla, and Rollie Baltazar was who else but FPJ himself! I’d rather not say who I was. After all, I was games-master along with Mr. Avegel Leynes. I shouted myself hoarse through the parlour games. The normally dignified teachers were laughing hysterically, some rolling on the floor while doing so. They were cheering, cheating, complaining! Frankly, the seniors were always easier to manage! They were having a helluva good time, though, and I would gladly have gone through it again. The most hilarious moment came during the “aswang” make-up contest. FPJ Productions originally designated Sir Cris for the make-up contest. When I announced that an “aswang” was to be made up, members of the group hastily pinned Mr. Baltazar down to his seat before he could make a getaway. Layers of talc were slapped on his face, the skin around the eyes further darkened, red lipstick smeared here and there. The result was really macabre, almost like, as Sir Cris described it, a person who was murdered, left in the fields and not discovered until two weeks later! The beginning of February was for the STRAA. My team and I wanted so badly to bring home the bacon for Ariel. Yet, even as we left, I still had my doubts. My team never knew I had them, of course! I was just that, having coached teams for nine years, I could almost sense what chances my teams would have in tournaments. In 1989, the last time we won the STRAA, I knew even before the tournament started that there was no way we were going to get pipped for the title. Not so this time. I wondered if the choice of Erick Kalalo as Ariel’s replacement was not more an emotional rather than a pragmatic decision. Though I had the highest regard for Erick’s talents, he was a long, long way from match fitness. Perhaps Rommel would have been a wiser choice? I also felt uncomfortable about taking Don Ilagan along. Not only had he missed most of the RIFA season because of hepatitis, he also missed several intensive fitness build-up sessions for the STRAA. Three straight wins hardly justified my fears. However, on the last day, as we fought for gold, the team inevitably collapsed. Two of my only three substitutes were in sick bay, the third suspended. There was also this little matter of my best player lying six feet below the ground, a long way from where we were. In the heat, my jaded crew had only enough wind for a bronze finish. Still, it was a pretty nice outing. I always enjoyed taking my teams out, the closeness almost like a family affair. If only the conditions were more civilised! The comfort rooms were downright barbaric, a throwback to the days of the datus and the alipins. I mean, you had to squat on the ground, get it? There was just this hole in the ground and never mind! Eventually, I had to check in at this seedy little hotel each morning for my morning baths and nature calls. It cost me an arm and a leg, but it was better than adding to the supply of organic fertilizer in the Lipa camp. Didn't I say that as coach, I also often had to be the one to fire the bullets? Sometimes, I also brought bad tidings! On the last day of the STRAA, as my team sat bitterly disappointed over our failure to win the gold, I had to break the sad news about Archie Perez’s death by vehicular accident in the same afternoon that the STRAA was just starting. How traumatic could a day get? For me, at least, it was a load finally shared. Sid, Doc, and Taxi had called home via long distance and were told about the accident. Eric Doria and I were at the LBC desk writing to the rest of the team when the trio arrived to tell me what little they knew of the details of the accident. Between us, we agreed not to break the bad news to the rest of the STRAA team until after the tournament. For three days, we lived under tremendous strain, trying to pretend everything was normal whereas, in fact, the whole world seemed to be falling apart. I barely held myself together. I was still struggling to come to terms with Ariel’s untimely demise, now here was Archie going the same route! If only I could have done something to prevent the accident! I swear to God I knew something nasty was going to happen, though the blips on my radar screen got all mixed up. For at least a week before Archie’s death, I had become almost insanely protective of Taxi. I was so sure something terrible was going to happen to him! I would stay awake at night, just fretting; or my sleep would be frequently interrupted by wild palpitations. The premonitions only stopped in the afternoon of February 3, the heaviness in my chest finally lifting. Taxi, had, from all indications, survived; Archie, though I was to know it until later, didn’t. In retrospect, perhaps I was not really all that surprised when I was told about the accident. If only I could have done something to prevent it! On the day Archie was buried, Erik Carbonilla bitterly remarked that attending funerals was becoming, for us, a nasty habit. How painfully true. I was heartened by the sight of so many seniors at the funeral. You people knew how to take care of your own, never mind that Archie was two years younger. Call me superstitious, but something I called the “A-factor” was getting into my nerves!